Whether you serve in the military, want to be prepared when disaster strikes, or are just an ordinary hiking and camping enthusiast, you stand to benefit from great tactical gear. First, you’ll want to consider accessories, including flashlights, bags, and more. You’ll also want to think about apparel. How can you protect yourself while maintaining mobility? And what clothing will best protect you from the elements in a survivalist situation? Next, you’ll need to think about weapons. A single weapon can’t accomplish every task, so making sure to buy the best for each category is the way to go. A complicated firearm with fancy, useless features and attachments won’t serve you as well as a product streamlined for a specific situation. And just because a weapon has a high price tag doesn’t mean it’s going to be the best for what you need it for. We review different types of accessories, apparel, essential survivalist tools, and much more, so you know what to look for. The Tactical Guru also covers a range of DIY projects you can use at home to be prepared for anything. Why would Someone Need Tactical Gear? Surviving a life-or-death situation is not something that everyone has given thought to. The 2008 stock market crash led many preppers to warn the public about doomsday and encourage them to prepare. We saw similar circumstances before Y2K and during the Cold War. But since doomsday never happened, some people have gotten a bit smug, believing that survivalist preparation is pointless. But just because these specific events never led to doomsday doesn’t prove that it won’t occur. A pandemic could happen (just check out this long list of historic examples), nuclear proliferation is a risk, and the U.S. economy is more fragile than it looks. But what if doomsday doesn’t come and we are never hit by another widespread disaster? Would all that preparation have been for nothing? Earthquakes, fires, hurricanes, tornadoes, and floods are happening each year. In 2017, the U.S. had at least 49 natural disasters that left its residents stranded and injured. Even though doomsday might not come, natural disasters are pretty much guaranteed. If you have tactical gear on hand, you’ll be ready to bug out or weather the storm until conditions stabilize. Even though you do have to buy items upfront, tactical gear and other prepping items can end up saving you money in the long run. Learning how to hunt, for example, can give you an endless food supply for when times get tough, even if you’re never in a physically dangerous situation. And stocking up on food items when they’re on sale means saving money, too. Tactical gear can help you with unexpected, everyday difficulties such as car trouble. If you keep supplies in your trunk when you break down on the highway, you’ll be better off. Imagine getting stranded in a snowstorm without a solar charger, water, snacks, blankets, or a flashlight. Having your survival gear on hand would put you in a better situation. You may live in a safe area, but the unexpected can always happen. While you can rely on calling the police, wouldn’t you rather know that you’re prepared to defend yourself no matter what? Crimes are always happening, even in relatively safe areas. With your tactical supplies and knowledge about self-defense, you’ll be ready to protect yourself and your family if this type of situation happens to you. Most people are okay with relying on a hospital visit in the case of a medical emergency. But having a quality first aid kit and knowing exactly how it works will increase your chance of survival while waiting for an ambulance. And what about a situation where you don’t have access to a phone or can’t get a hold of an ambulance for some other reason? You would have nothing to lose by being prepared. Depending on the type of tactical gear you own and practice with, it could help you stay in much better shape. Hunting regularly, building things, and knowing self-defense mean getting a lot more exercise than you would sitting at home in front of the TV. Plus, this will give you a list of new skills to learn and a purpose to get excited about. When a natural disaster strikes, many people will experience power outages. This can mean having no electricity for a few hours, a day, or even weeks. If this happened to you, would you know how to stay warm, find food, and see in the dark? When you’re prepared, power outages are far less threatening. There’s a common stereotype out there that survivalist types are paranoid or stressed out. But nothing gives you peace of mind quite like knowing you’re ready for whatever life throws at you. Whether doomsday hits or not, prepping gives you the advantage of always being prepared. And not only will you feel calmer, but you’ll be proud of all the effort you’ve put into learning these skills and collecting these tools. When you invest in tactical gear, you’ll have physical proof of your efforts. Think of what this, along with knowing you won’t be helpless even if disaster strikes, can do for your self-esteem! Survivalist activities can help you get closer to your family and friends as they are better done together than alone. It isn’t just about getting the most efficient supplies and stocking up on food. It involves outdoor adventures like camping and hiking, learning how to build, and practicing basic survival. All of this can give you valuable bonding opportunities with the ones you love most. When the government and society break down, who do you think will take over? Unfortunately, when this happens in other countries, organized criminals are the ones stepping up. This is because they’re not afraid of risk, and are armed and organized. This is happening now in Syria, Libya, and Iraq where militias have seized control of local areas while the population has to deal with it. There are also examples of this in Mexico where drug cartels control much of the nation. Police officers and military are still there, but law and order are not what it should be. In situations like this, local communities can no longer fully rely on law enforcement and instead must protect themselves. If God forbid, a situation like this ever swept America, wouldn’t you rather be prepared to do so? When you’re getting ready to survive in the wild, there are some supplies that you absolutely need. The main categories of survival are shelter, fire, water, and food. There’s also self-defense, land navigation, and first aid to consider. If you can cover these bases, you’re set to survive just about any situation, no matter how harsh. Let’s look at some examples of using tactical gear. Whether it’s by police, firefighters, or EMTs, tactical gear is useful for many purposes. This gear is worn because of its high-quality, but also because of the storage it offers with multiple pouches and pockets. When professionals must be self-contained in the field, these compartments are all very useful. But why would your average survivalist need them? The simple answer is that efficiency is important. One of your main goals should be carrying all that you need, while keeping your hands free for self-defense and without sacrificing mobility. 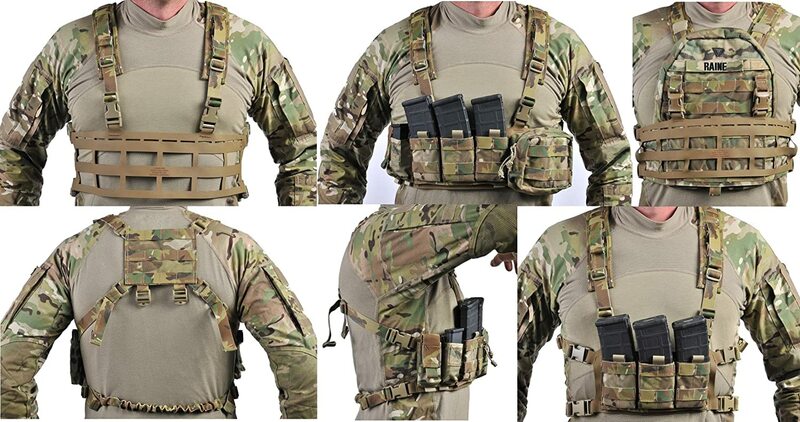 So whether you go for full-body armor, a chest rig worn over your clothes, or tactical pants, pockets are definitely useful. Survival weapons are useful for nature hikes, camping, hunting, and of course, getting ready for the possibility of disaster. Since so many different types exist, it’s important to assess your needs and get a specialized tool for each purpose. This helps with the maintenance of your weapons and will help you stay prepared. Think long and hard about what you will use for what. With rifles and pistols, for example, you have solid self-defense and hunting covered, but if you don’t have the skill of making your own ammo, they’re limited. In addition, these guns are loud and can be counterproductive if you want to remain hidden. Knives, of course, can be used for dressing game and for self-defense. There are also folding knives for everyday uses. But most survivalists know that using a single knife as a multi-purpose tool could wear the blade out faster and make it less efficient. Weapons are necessary for self-preservation. Knowing which weapons will serve you well in certain situations and which ones will only limit you can help you build up the best collection possible. One main advantage to tactical-style clothing is that military-grade items come with camouflage. That is exactly what the enlisted would wear in the field and you can’t deny that it looks pretty cool. But keep in mind that it’s unlikely the military is carrying out combat missions in your hunting area. So the camouflage style they make might not be meant for you. Try looking at everyday tactical pants, instead. The backpack is a simple invention and is an easy area to separate civilian and tactical styles. Nowadays, ordinary civilian camping packs are more comfortable than before and much lighter. For long-haul camping trips and hikes, these are an obvious good choice. But keep in mind that going for a bag like this will mean you’re missing out on those great organizational pouches we mentioned earlier. Lastly, there are tactical vests, popular with adventure-seekers, preppers, and survivalists of all types. Most tactical vests can be adjusted and have a holster for your sidearm, along with space for ammunition magazines. When you’re in the field and need quick access to your gun, this is the most convenient way to get it. We’ll cover these useful implements in more detail below. As you can see, there are definitely some advantages to choosing tactical gear over ordinary gear for survivalist reasons and in some cases, outdoor adventures. We covered tactical vests briefly above and mentioned that they’re great for their gun holsters and room for ammo. But they are also your first defense for covering vital organs in a dire situation. Modern day tactical vests are combination load bearing vests and plate carriers. The integration of modern materials makes these vests unit integral and user-friendly. All security forces and military today are using tactical vests for their troops. Tactical vests can also be used to carry armor like steel plates and SAPI plates, which stop enemy bullets from penetrating the body. When the right plate is carried by the vest, projectiles are immediately stopped. It also ensures that the plates stay put when soldiers are moving fast, offering maximum protection. Hard armor is meant to protect your heart, lungs, and other vital organs. Always make sure the back and front plates are up high enough to do this job and that the armor doesn’t move side to side when you twist, bend, or run. Spread loading tools and magazines on the tactical vest is beneficial, as well. Modern vests are made from durable nylon and offer various camouflage patterns suited for green vegetation, urban environments, or even desert-like surroundings. Can tactical watches be useful for wilderness and urban survival? A challenging survival scenario can happen at any time, so looking for ways to be more prepared is always a good idea. But carrying your survival items everywhere with you in daily life just isn’t practical. This is where finding lightweight tools with many functions can serve you. In our world, where most people just look at their phones to see what time it is, watches are mostly worn as a fashion statement. This means we forget all about their essential function; telling time. The way your tactical watch will display time depends on what you prefer. Analog or digital, standard 12-hour or military, or a combination should be possible with many choices. But on top of just showing the time, tactical watches provide plenty of other useful features that will serve you well in a survivalist situation. This includes a sunset/sunrise indicator, full calendar, and more. Knowing the time, even in a chaotic situation, will help you keep a sense of continuity and stability. A tactical watch will help you know whether you’ve boiled your water for long enough, how much daylight you have left, and when you should check your traps. Tactical watches can help you find your way when it matters most. Navigation features can mean anything from simple orientation to recording data about elevation. Tracking elevation can help you figure out whether you’re going the right way in addition to topographical maps. If you only plan to need simple navigation, a compass on your watch could be enough to get by with. Some watches have button compasses built into the band and other options have analog or digital displays. For more exact navigation needs, a tactical watch with a GPS readout can show you where you are with a digital display. This will be helpful if you must record or share your exact location for coordinating a meeting point, locating a camp, or conducting a search and rescue mission. For daily or ordinary uses, approximate location should be enough. For those who spend lots of time outdoors, however, a tactical watch with GPS is best. Some people already know that heart rate monitors can be used for fitness training, but did you know that it can track your activity in a survival situation? Most people won’t have a stethoscope handy if they’re found in a dangerous or disastrous situation. In that scenario, the next best item you can use is a heart rate monitor. If you or someone with you gets severely injured or sick, this useful function can save a life. For conditions like shock, blood loss, and disease, you will need to monitor the heart rate and know when it decelerates or accelerates. Tactical watches are among the most useful forms of wearable technological gear. With specialized functions and countless practical uses, these watches can give you the information you need to survive when disaster strikes. Check out the best military watches available on the market here. Flashlights are not often thought of as weapons, but they can be one of the best tools for defending yourself and your family. Not only that, but tactical flashlights, of course, have many practical uses. If you have a handgun for a defense weapon, you need a flashlight for shooting in low-light. This not only helps you see the target but will help you locate your gun sights when it’s dark out. Even if you choose not to have a gun for self-defense, your flashlight can save you in a dangerous situation. For starters, flashlights can be taken anywhere with you, even in areas where guns or other weapons are banned. Two important functions are served by tactical flashlights in self-defense situations. They also serve a bonus purpose. Many attackers use darkness to their advantage, hiding in the shadows or low lighting. Your flashlight can be the difference between remaining oblivious to these threats and identifying them. Being ready with a bright light eliminates your attacker’s advantage of hiding in the dark. Just shining your flashlight towards him will often be enough to send him running. If you’ve ever had someone shine a flashlight at your face in the dark, you already know that it can momentarily blind and disorient you. This natural reaction can be used to your advantage in case of a nighttime attack. As soon as you identify a potential threat, shine your light into the attacker’s eyes. This will lead them to cover their face and experience a few seconds of semi-blindness and disorientation. That opens up a window of time for you to either attack or flee the scene. A bright LED light is best for this purpose. Many tactical flashlights have a toothed or serrated bezel. This bezel can be used as a striking device if you come under attack. Once you’ve disoriented your attacker by shining your flashlight at their face, you can use the bezel to strike them. As soon as you’ve made a list of necessary items for tactical gear and more, run through the list and begin minimizing items. Your tactical bag or backpack should be for essential items, not for holding everything you own. For starters, you can’t carry 70 pounds of tactical gear that far and it would only slow you down, even if you could. Create the list, then cut the list down. Then cut it down again. This step is very important. Once you’re done packing, you’ve likely already packed your bag too full. Over-packed backpacks can lead to health issues, and the last thing you want in a survivalist situation is this type of injury. Once you’ve packed again after getting rid of what you don’t need, try to walk around your neighborhood with the backpack and see if it feels okay. Next, bring it out to nature where you can test it out on hills. You may be surprised at how much heavier it feels on a hiking trail than walking on flat ground. Make sure you rotate your prepping and survival medicine, vitamins, and food. This doesn’t just apply to what you keep in your backpack, but also your stock at home. Instead of packing your basement full of canned food and then locking it, you should use it in addition to the food in your fridge. Take note of the items you have and the date they need to be replaced. Trust me, waiting until disaster strikes and then seeing that your food is bad or your medicine is useless is not what you want. You might run across useful items when you’re prepping or when a disaster strikes. If you don’t already have space in your bag to store it, you will either miss out or have to throw away an essential item to make room. Plan ahead and leave space for these items. Survival is all about seizing opportunities when they present themselves. Your tactical backpack should fit items you find and pick up or items that need to be replaced. For example, you might be walking through the woods and pick up some kindling and tinder to bring with you. If your backpack doesn’t have enough space for it, you’ll have to carry it which can be inconvenient. Everything in this situation must be carried or worn. You can’t afford to have anything less than the best when it matters most. Look at this ultimate guide for finding the best tactical backpack. The most accurate, powerful, and fastest bows on the market are modern-day compound bows. Below, we’ll cover a couple of the main parts of a compound bow. The Limbs: The limbs on a bow flex, building up and releasing energy and momentum. The Riser: The riser, also known as the “chassis,” holds the bow’s limbs, providing an area for the handle. The riser can also mount items such as the arrow rest, sight, stabilizer, and more. The riser must be strong and light and should not flex. There’s no shortage of choices out there for a compound bow and as with other products, it can be hard to find the right choice, especially online. Our Buyer’s Guide for compound bows can help you with this. Your compound bow is a dangerous weapon that can propel a rod made of graphite more than 300 feet in record time. This simple tool can bring down a bear or elk. But you must follow some basic safety rules to make sure you’re using it correctly. Pointing: When you hold your bow, don’t ever point it at anyone or anything except for a specified target. When you carry your bow, it should be held at your side loosely without the arrow nocked. Preventing Misfires: Your bow should never be drawn until you’re facing your target and getting ready to fire. This precaution will prevent misfires if you trip or get bumped while holding the bow. Practice Guidelines: When you’re practicing with your compound bow, make sure you are only using targets meant for archery. This means no cardboard, no soda bottles, and no paper. The arrow flies with a speed that requires special foam targets; otherwise, it will go through the material and risk injuring someone behind it. In addition, it shouldn’t be shot at a solid surface. Shooting your bow towards a brick wall, for instance, can harm the arrow. Much of compound bow safety is general common sense. Eventually, you’ll get to know the nuances of the bow and feel more comfortable using it. Until then, always exercise caution. Tactical knives are often confused with fighting knives since they can be used as such. But tactical knives are primarily meant to be used for utility purposes, not for self-defense reasons. You can designate your knife for either task, but for best results, be strict about using them only for their designated purpose. If a knife is meant to be your self-defense weapon, don’t use it to open boxes or slice tree branches. When and if the time comes, you’ll want it to be as sharp as possible for saving your life. The exception to this is an emergency, of course. For each knife you own, you must know why you have it and use it accordingly. Your duty uniform or tactical kit should be adapted to changing environments and hazards. The right accessories will allow you to quickly change your load-out when needed. From durable watches to reading lights, to bags, slings, and gloves, all of your attachments and supplies should be built to last and provide superior utility. To build up your survival arsenal, you’ll need to consider close-quarters self-defense, self-defense within 200 yards, and defending your perimeter. There’s also hunting both small and large game to think about. For survival purposes, the best weapons will be durable and simple. For this category, you’ll have to choose to invest in either military-style gear or civilian-style gear. Both are useful, but tactical armor and military-grade supplies rarely get the attention they deserve. Military-grade accessories and apparel can improve anything from a life-or-death hunting expedition to a paintball game. When it comes to protecting your body, you shouldn’t have to sacrifice mobility for safety. Tactical armor gear is specifically designed to both protect your body and allow you free movement in special operations or critical situations. This includes tactical vests, helmets, full body armor, headgear, plates, and more. The military has access to only the best tactical gear. The Special Forces get their apparel from the highest-quality brands available on the market. From night vision equipment to knives, to camouflage accessories and bolt-action rifles, their equipment is top notch. Nothing is better than getting the tools that the military depends on and uses every day. The police are trained to handle danger beyond most people’s wildest dreams. For this reason, they are equipped with the best of the best when it comes to defense and other tools. Whether it’s night vision goggles or boots, always look for law enforcement-grade materials when applicable. Dryer lint is completely free and you can even find it in your pockets in an emergency. It’s compressible, light, and very flammable. But dryer lint has to be very dry, so start collecting it in a plastic baggie now, and keep in mind that synthetic lint doesn’t work as well as other types. This is a trick as old as time itself. Cotton balls coated in Vaseline can be stored in a plastic container. Petroleum jelly is very flammable and can be used to start a fire. Surprisingly, it burns for quite a while. Cattails can be broken open and the fluffy material inside can be lit like cotton or paper. Obviously, they must be present in your area for this to work. But like the other items on this list, you can start collecting now and be prepared when the time comes. You can coat wooden popsicle sticks with candle wax and use them as tinder. Just put them about two inches into firm ground and light them. They will burn for no longer than 10 minutes. To make the burn hotter and help it last longer, you can layer paper or wrap lint between two sticks before dipping them in wax. Since the wood used for these is dense, popsicle sticks burn hotter and longer than lint or paper-based items. The wax is what allows them to easily light and should work even for starting a fire with wet wood. Keep these in two plastic bags so the wax stays intact. Everyday carry items are objects that you have on your person most of the time that allow you to handle emergency and everyday situations. Any good survivalist needs to know what’s on their EDC list. These objects can help you get back home after getting lost, can serve ordinary functions, and may even be the reason you survive. Ideally, your EDC items will be small and few. They should all be possible to carry with you without a backpack or extra container to cart around. Since your wallet carries your identification, money, and cards, it’s obviously an essential item. It would likely remain so in a survivalist situation. Whether you’re in a catastrophic circumstance or not, your keys are important. Consider adding a keychain with Paracord or a compass for extra efficiency. Keeping your phone with you means being able to contact the authorities or your loved ones in case an emergency strikes. If you have GPS on your phone, that’s an added plus. Although a charging station obviously isn’t an everyday carry item, your phone won’t work for long in a survivalist situation if you don’t have a way to charge it. A power bank can be the solution to this. Consider adding it to your at-home prepper kit. One of the best survivalist multi-tools available, a military watch should always be on your wrist if you’re a survivalist. This can serve for time-tracking, keeping tabs on elevation information, and knowing when sunrise and sunset are. Some watches also allow you to set alarms. For the best results, find one that is both comfortable and lightweight. A pocket knife is a great EDC item to have on hand at all times. Whether you’re preparing to kindle or just need to cut some rope, this item should always be on your everyday carry list. Your everyday carry list is something you should constantly think about and revise. Look for ways you can combine multiple items into one for added efficiency, and consider whether you really need all the items on your list. This list, plus your tactical gear and more, will increase your preparedness for disaster and readiness for the great, wild outdoors. You don’t have to expect disaster to benefit from collecting survivalist tactical gear, though. Perhaps you like taking cheap backpacking trips or just want to find the best waterproof bag for your next excursion. Whatever the case, following The Tactical Guru will be a wise choice on your part. Happy prepping and exploring! Wonderful prepper blog. Going straight to my bookmarks.